Given that the vast majority of therapeutic antibodies have a conformational or discontinuous epitope, Pepscan has developed a unique, high resolution mapping technology to characterize such epitopes with high accuracy. Many leading companies apply our CLIPS Precision Epitope Mapping to their most promising antibodies, several of which recently received FDA breakthrough status. As a discontinuous epitope consists of non-adjacent parts of the protein sequence, CLIPS Discontinuous Epitope Mapping applies a combinatorial matrix design and different CLIPS scaffolds to convert the target protein into an extensive library of conformationally constrained mimics that has sequences which are not adjacent in the primary sequence brought together by a CLIPS scaffold. This library of CLIPS-based tertiary structure mimics is then synthesized on a solid support, using high-throughput microarray synthesis technology. The binding of the antibody to each peptide construct of the entire library is determined. Designed constructs containing both parts of the interaction site in the correct orientation are bound with the highest affinity by the test antibody, which is detected and quantified. Constructs representing the incomplete epitope bind the antibody with much lower affinity, whereas constructs not containing (parts of) the epitope are not bound by the antibody at all. Bioinformatic statistics-based analysis of the combined binding data is used to define the sequence and conformation of epitopes in detail. CLIPS Precision Epitope Mapping allows detecting of conformational, discontinuous, and complex epitopes involving dimeric or multimeric protein complexes. For further details see the Technology section. 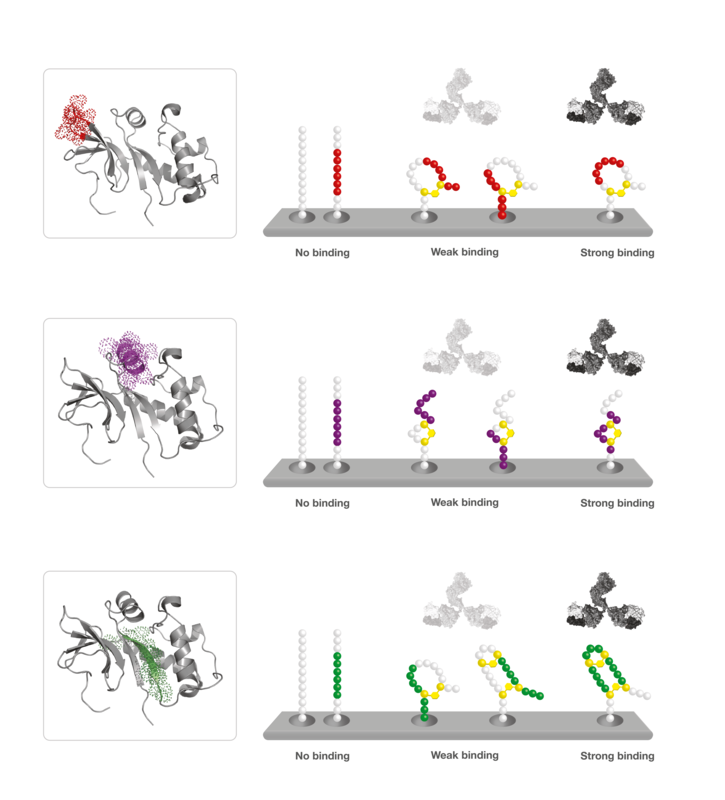 CLIPS Precision Epitope Mapping offers unrivalled single residue resolution and can determine the role of individual amino acids to the binding of an antibody (Fine Mapping). Because the arrays can be washed and re-used multiple times, it is the only method for comparative mapping of a series of samples. CLIPS Precision Epitope Mapping revealed distinctly different binding sites for rituximab and ofatumumab on CD20 and demonstrated that ofatumumab uses a unique discontinuous binding site. This information was crucial in assuring freedom to operate and for patent filings for ofatumumab. It also contributed to the understanding of the mechanism of action and offered a valuable opportunity for marketing differentiation. 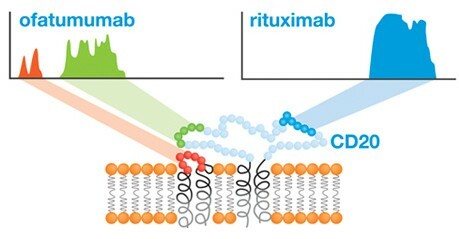 Precision Epitope Mapping revealed distinctly different binding sites for rituximab and ofatumumab on CD20 and demonstrated that ofatumumab uses a unique discontinuous binding site.